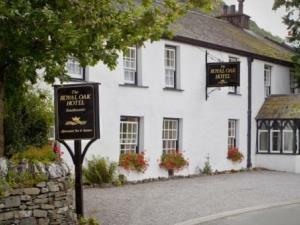 Royal Oak Hotel Small HotelThe Royal Oak is a traditional Lakeland hotel ideally situated 6 miles south of Keswick. Once an 18thC farmhouse, and former miners tavern, it is still the perfect base from which to explore the Lake District. We take great pride in maintaining our homely atmosphere and excellent value for money. Although modernised with central heating, the thick walls, snug bar and cosy sitting room with open fire retain the hotels historic character. The main house offers 8 en suite rooms and 2 singles with private bathroom each with individual charm. Across the courtyard, our converted barn provides an additional 4 spacious riverside rooms each with en suite facilities and peaceful views. We serve English breakfasts and hearty home-cooked table d'hote dinners that sustain even the most energetic. Vegetarian meals, and packed lunches are also available. We offer a selection of local beers, the usual spirits & liqueurs and an affordable and appealing choice of wines. In our attractive bar, there is always someone with whom to discuss the days’ events. It is a great compliment, that so many of our guests make friends with one another and return time and time again. The Royal Oak is a traditional Lakeland hotel ideally situated 6 miles south of Keswick. Once an 18thC farmhouse, and former miners tavern, it is still the perfect base from which to explore the Lake District. Royal Oak Hotel sometimes limits bookings to 3 or more days. Double/Twin Room. Riverside room with one double and one single bed. Children sharing with two adults pay half rate 5 - 17yrs, quarter rate 1 - 4yrs, babies nominal. We normally offer DB&B, this is available at an additional £16. 23 sometimes limits bookings to 3 or more days. Six miles south of Keswick on the B5289 in the centre of the small hamlet of Rosthwaite. The Royal Oak is a precious window into the past. Good old fashioned family service, lovely old buildings and bucollic setting. It could do with modernising the menu and allowing a little more choice of dishes (currently you get what you're given although they will flex for dietary requirements). Also wifi in all rooms would be good as would TVs in the room not just the lounge. Currently the perfect spot to switch off.